A west coast community is in dispute with a major power company over giant wind turbines that are allegedly causing health problems. Residents of Fairlie, near Largs, claim that turbines at the UK’s only offshore wind turbine test site have caused dizziness, sickness, headaches and sleep disturbance. But the local health authority said it is “unlikely” that the wind turbines are the cause of symptoms experienced by individuals. The National Offshore Wind Turbine Test Facility is run by Scottish Southern Energy (SSE) with two turbines standing at 177 and 193.5 metres at Hunterston. The site is around around one and half miles from the coastal village of Fairlie which sits across from the Isle of Arran and the Cumbraes. The facility was established in 2012 for a five-year period. In January, SSE applied to North Ayrshire Council for a two-year extension for the site which, if granted, would start in October 2017. However, after objections by residents the issue has been referred to the Scottish Government after SSE submitted an appeal against the non-determination of the application by North Ayrshire Council. Villagers complaining of health problems include Rita Holmes, of Fairlie Community Council, who lives less than two miles from the turbines. A supporter of wind power in principle, she said that SSE’s application for an extension should be refused and health issues fully investigated. Holmes claimed that infrasound and low frequency noise from the site has affected the health of at least 13 people, adding that SSE gives her advance warning of the turbines operating so she can move away for the duration. Another Fairlie resident, a chemist called Dr Jackie Pearson, said: “You feel rotten, it’s like a vague nausea, like a malaise. If you stand in our garden at the wall, you can feel it. Dr Pearson also pointed to similar problems reported last year in Germany when people living close to an offshore test site claimed that they suffered ill-health. Another Fairlie resident spoke of similar health problems when the turbines operated but asked not to be named. 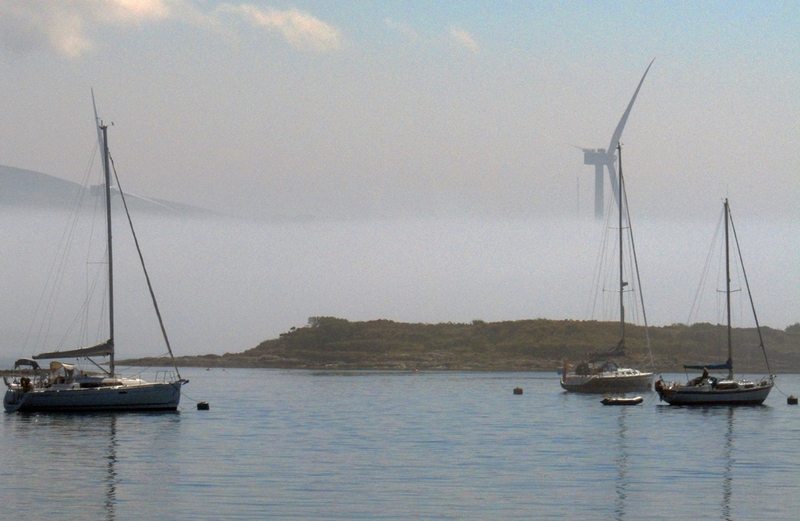 People on the Isle of Cumbrae have also reported health problems when turbines operate. Karen Brodie lives in Millport and told The Ferret she’s been seeking medical help for more than a year. She said: “I suffer dizziness, increase in tinitus sounds and feeling of collapse, which is like a feeling of gravity pulling me down to the ground. I have been attending my GP and the consultant at ENT, Crosshouse Hospital, for over a year, trying to find out what is causing the dizziness and other symptoms. Holmes added there are no regulations in place to govern low frequencies and infrasound for the wind industry and that the Scottish Government has to “wake up to the problem”. She was backed by Dr John Yelland of the UK Independent Noise Working Group (a voluntary organisation) who holds a physics PhD from Oxford. He said: “It’s time for governments, far too long in thrall of the wind energy industry, to make the effort to understand the real science of wind turbine noise and legislate accordingly”. Dr Yelland has written to Health Protection Scotland to raise his concerns. He wrote: “North Ayrshire Council (NAC) have chosen not to address the problems of the AM (amplitude modulation) and infrasound content in wind turbine noise, despite the considerable and widespread documentary evidence of the harm that it can cause, and to ignore my independent expert advice thereon. “This omission is the more serious as the offshore turbines in question are both larger and higher powered than any onshore turbines; their acoustic emissions are therefore proportionally both higher in power and lower in frequency than those of onshore turbines. Last year, NHS Ayrshire and Arran said there was no evidence to support the claims of the objectors. It had analysed general practice data from 2009 to 2016 to ascertain whether there was an increase of dizziness since the wind turbines began operating. “The data, both for Fairlie and for other areas close to the turbines, do not show any increase in the number of people reporting symptoms of dizziness to their GP, following the installation of the first wind turbine at Hunterston,” said a letter from the health agency. In a new statement issued on 14th August 2017, NHS Ayrshire and Arran reiterated its position but added that it could not completely exclude the possibility that the turbines were causing health impacts. The organisation explained that following a North Ayrshire planning meeting in June 2017 the government’s Health Protection Scotland carried out an objective review of evidence. Four scientific reviews were considered, and there was now “a clear consensus of expert opinion”, said Dr Joy Tomlinson, Interim Director of Public Health at NHS Ayrshire and Arran. “NHS Ayrshire and Arran’s Public Health department fully accept the findings of Health Protection Scotland,” she added. SSE said it had investigated complaints and that an independent consultant found that low frequency noise levels from the wind turbines “were within the accepted criteria for the survey and were at a level not expected to cause disturbance”. A company spokesperson added: “SSE has engaged closely with North Ayrshire Council regarding noise concerns at the site, and North Ayrshire Council has advised SSE that there is no statutory nuisance pertaining to the site. “As a responsible owner and operator of renewable energy SSE takes concerns or complaints from members of the community close to our sites very seriously and has undertaken noise monitoring to investigate the noise concerns raised. SSE also pointed to information provided by NHS Ayrshire and Arran that there is no causal link between wind turbines and ill health. North Ayrshire Council said it had been advised by NHS Ayrshire and Arran’s Consultant in Public Health and Health Protection Scotland that there is “no reliable evidence that wind turbines cause adverse health effects in the population”. A council spokesperson added that SSE has submitted an appeal to the Scottish Government’s Planning and Environmental Appeals Division Planning and Environmental Appeals Division (DPEA) against the non-determination of the application by North Ayrshire Council. “The council will provide a statement of case on the appeal and this statement has to be informed by the council’s planning committee which will meet on 23 August – the earliest possible date the committee could meet to consider the matter,” said the spokesperson. The Scottish Government said that an appeal has been received by the DPEA. “The appeal is in the early stages of processing and an independent reporter will shortly be appointed to decide this appeal,” a spokesperson said. The impacts of infrasonic noise and amplitude modulation (AM) are difficult to record but there was a recent expert report for the government on the issue. Photo courtesy of Karen Brodie.